"Before the staff in reception were welcoming." Have a question for Rinya House? "Room very clean and comfortable." "Staff very professional, helpful and friendly." "Cafe bakery has good food and the best coffee I had in Pattaya." "Had a great stay here." Located in the lovely area of Central Pattaya, Rinya House enjoys a commanding position in the shopping, beaches, nightlife hub of Pattaya. The city center is merely 0.5 Km away and the airport can be reached within 90 minutes. With the city's main attractions such as Witherspoons, Slices Pizza, International Gym within close reach, visitors to the hotel will just love its location. The facilities and services provided by Rinya House ensure a pleasant stay for guests. To name a few of the hotel's facilities, there are daily housekeeping, free Wi-Fi in all rooms, Wi-Fi in public areas, car park, room service. All guest accommodations feature thoughtful amenities to ensure an unparalleled sense of comfort. Besides, the hotel's host of recreational offerings ensures you have plenty to do during your stay. Superb facilities and an excellent location make the Rinya House the perfect base from which to enjoy your stay in Pattaya. "Room was big ,bed comfortable and good air conditioning and..."
Please note that the hotel reception is closed at 11:00 pm. Guests arriving outside the mentioned time are requested to contact the hotel front desk prior to arrival, so alternative arrangements can be made. I stayed at Rinya house for the second time. The value for what you get was good. The food in the bakery was excellent. Pizza buffet every wednesday night. The owner, Wit, is a great guy who is happy to help with information or a chat. The room was comfy and quiet. Location was excellent. Nightlife and restaurants all around and only 5 minute walk to the beach. I enjoyed my stay and will stay there again. Pretty well the same review as my last stay. I had to get 2 extra rooms for additional travelers in our group, so I found this one close to our original. I had trouble finding the front desk, and if it were not for GPS I never would have found it. Once i did, everything went smooth, the rooms were nice with a comfortable bed and even a fridge and microwave. The breakfast is down at the bakery, which serves as the front desk for the hotel. Very friendly staff, great location. The hotel is attached to a great bakery. The room was comfortable. Staff was great. I stayed at Rinya house for the first time. The value for what you get was good. The food in the bakery was excellent. Pizza buffet every wednesday night. The owner, Wit, is a great guy who is happy to help with information or a chat. The room was comfy and quiet. Location was excellent. Nightlife and restaurants all around and only 5 minute walk to the beach. I enjoyed my stay and will stay there again. nice big quiet room, free wii fi in room, free safe deposit box. I booked a 1 bedroom King Bed room with kitchenette. The room is very large, well furnished with an interesting bedroom with glass doors. Very good value for money. The main advantage, for those that want it, is it's close location to many bars and restaurants in a lively Pattaya night area. You will not need any transport as everything is in easy walking distance. Rather poor breakfast though with limited choice. nice little hotel surrounded by the nightlife of pattaya, but not too noisy that you are kept awake all night. my room was facing the street, so there was some traffic noise but nothing too major. room was spacious, bed was big and comfortable. everything was working, no major complaints. wifi internet was fast. the best thing is the little french bakery at the lobby. they serve the best breakfast all day! you can also order fruit shakes, thai and western food. very cosy atmosphere. service was good, staff are friendly. The bathroom was joining a kitchen behind the hotel and the room smelt of fried fish 24 hours a a day ,not to mention when you where in the bathroom you could here the staff of the restaurant as though the where in the shower with you ...crazy . Rooms very old, water pressure on 3rd floor is poor. Loaf restaurant is great but the breakfasts included with the room are mediocre. Staff tried try to be friendly but there are better value options nearby. Had a great stay here. Room very clean and comfortable. Room was back off the street a little so was very quiet. Staff very professional, helpful and friendly. All have good English. Cafe bakery has good food and the best coffee I had in Pattaya. Location is very central. Easy walking to bars, restaurants, the beach, shopping malls and places like Walking Street. Would prefer higher water pressure for the shower but it was adequate. I would definitely stay here again and highly recommend Rinya House to singles and couples. Location, Clean, Bakery on first floor. The price on Agoda includes breakfast. I'm not talking pastries and coffee. Three choices #1 Bacon and Eggs with toast and coffee. #2 Chicken and Rice and coffee. #3 Fresh fruit bowl topped with yogurt and coffee. Great place for the price. I wasn't expecting anything special. So when I arrived and saw a very basic room (1 BR Kitchenette). I got exactly what I paid for. Staff sits out in the hallway waiting for people to leave. They quickly clean your room and usually give you 2 more bottles of water. One thing I did notice is no room is the same. Of the four exact same rooms we had, each one was slightly different including where the light switches are. Mine took awhile to find as it was located behind the tv and couldn't be easily found. I believe the same gentleman runs both the hotel and the bakery downstairs. I would highly recommend everyone have a few meals at the bakery. I had probably half of the menu during my 2 week stay and everything was great. All of the ladies working there were very very nice and always smiling. I will be back soon hopefully and this is where I'll be staying. This stay was again good. I was upgraded,at no extra cost, to a bigger room, the staff were attentive and the breakfast was great. 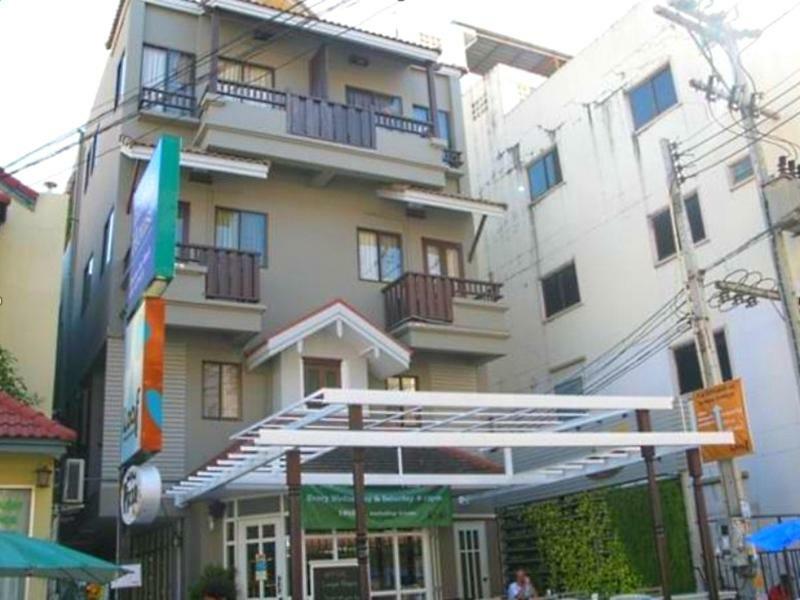 This hotel is well located in Pattaya, is quiet, despite its closeness to Pattaya's many attractions and it is safe. It was budget accommodation and felt like it. The rooms were quite dark and dingy but everything was fully functional. Breakfast in the bakery was good I some dealings with the Manager and found him very professional and responsive. Can't complain for the price, but it would have a much better feel if spruced up a bit. This hotel was in a great location for shopping and dining. Very good and friendly stay. The hotel had a very nice selection of fresh pastry. I would recommend it anyone. Very close to the Tuesday and Friday market for some great deals. Great hotel with perfect location, rooms are a bit aged especially standard rooms on ground floor which have no views. Some rooms electric plugs need to be replaced, furniture with rustic style but space in a plenty to put many things!Internet is fast and reliable.... The bakery offers excellent Breakfast and nice dishes on the menu. nice hotel in the convenient area, the owner offer us breakfast voucher which is not included in agoda and walk in price is cheaper than booking through agoda too so we booked 2 nights more and we got suite room with cheaper price than standard room from agoda. the owner is super nice and friendly. breakfast is nice! try their home made whole wheat! squeezed between two other hotel wings rinya is a basic budget hotel .checkin in through a side door off the restaurant .staff - there is no specific behind the counter staff to talk to , only restaurant workers who doubled as reception staff the room was a reasonable size and bed comfortable .there is no view apart from the building 1 meter away .air conditioning units are noisy so you can't use the mini balcony to get fresh air the wifi did not work despite numerous attempts .there was no one to help sorting out which was the correct wifi as the passwords would not work and i picked up 8 different sources breakfast was adequate but they just bring you it .there was no menu and i had to ask twice to vary the same basic eggs dish .there was no discussion to ask your requirements room was cleaned well each day .dont expect a quiet space as there is too much noise from restaurant ,air con units and people less than a few meters away . Good pastry/bakery downstairs. Room clean. Location interesting and practical in the center of town. Good value for money. stayed 2 nights and it was pleasant. will come back. best asset been the bakery shop downstair. shame they dont let customer eat cake or croissant for breakfast. i hate bacon and eggs and thats all i had to eat for breakfast. have to buy extra croissant and hot chocolate at premium price for my breakfast, like outside customer. sad room ok with simple furniture. small tv. not noisy. glass window as a door with not secure lock (bit frightening if you store valuable item in the room) but overall good adress. very friendly manager and polite staff and that's not the case everywhere.